Deliveries that do not require a signature may be left in a safe place at the driver's discretion.This will usually be out of sight and out of the weather. Areas may include the front porch, back porch, side door, or garage area. If deliveries require special delivery instructions they must be noted at time of order. Freight is on a per quote basis. Items stocked at THE BURLY BEAR store in Pinetop,AZ or at our artists, craftsmen or manufacturers are available for Express Shipping. The shipping times for Express Shipping is 3 to 4 business days from the date of purchase (not including Saturdays, Sundays or holidays). The cost for Express Shipping is additional to the standard flat rate shipping fees. Items that cannot be shipped using Express Shipping are noted in the product description. Free shipping promotions are not available for Express Shipping. The Burl Bear-Express Shipping is only available for orders shipped within the contiguous U.S. (excludes Hawaii, Alaska, Canada and APO addresses). Express Shipping is not available to P.O.Box or APO addresses. Call us direct or email us at sales@theburlybear.com for direct quote. Express Shipping, 2nd Day and Overnight shipments are available on stock items upon request at an additional charge.Call us direct or email us at info@theburlybear.com for direct quote. Quick Ship items are available for shipments to Alaska, Canada or Hawaii for an additional shipping charge. You will be notified of the additional charges prior to shipment. Call us direct or email us at info@theburlybear.com for direct quote. SHIPPING TIMES Shipping times vary by product. 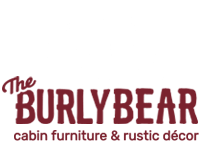 Some of our products are shipped from THE BURLY BEAR store in Pinetop,AZ , our artists, craftsmen or manufacturers locations.These items may take longer than one week for shipping. Please see the Estimated shipping time on the product information page or email us at info@theburlybear.com for questions related to availability and delivery times. TRACKING YOUR SHIPMENTS Upon shipment of your items. Your tracking information will be emailed to you. From this info you will be able to track your shipment using FedEx or UPS websites. Upon conformation of drop shipments from our artists,craftsmen, or manufacturers.The Burly Bear will send you tracking information for your items. The Burly Bear uses FedEx or UPS for shipping items which meet their size and weight limitations. If needed we can usually expedite these shipments upon request and for an additional charge, (SEE EXPRESS SHIPPING ABOVE). The Burly Bear uses Standard motor freight for large or heavy items. You will be notified by the Freight Company prior to delivery.Then your furniture will be delivered "curbside".The drivers WILL NOT help you take the items into your house,or help you with any setup. You MUST be home to accept delivery and unload the merchandise.You will be responsible for moving the furniture into the house and setting it up. We strongly suggest you having more than one person present when your oversized items,or furniture arrives to ensure you will have the help you may need. Assembly instructions are usually provided with any item requiring assembly. If you have question or the instructions were not provided email us at info@theburlybear.com and we will assist you as soon as possible. Our customers are entirely responsible for all freight charges and restocking fees if a delivery is refused. Both the restocking and freight charges will be subtracted from your refund when delivery is refused or canceled ounce your items are in transit. We Cannot ship Large or heavy items to Alaska,Hawaii or Canada. The Burly Bears- Freight carriers will usually notify you via telephone at least 24 hours prior to estimated delivery time. The Burly Bears- artists, craftsmen or manufacturers will include your contact phone number and delivery address on the bill of lading for the carrier to contact you. Once your order has shipped and the freight carrier contacts you, please clarify (Give special instructions if needed) to your delivery address. The Freight carrier will arrange with you for an approximate time of delivery, usually within a (2-4) hour time period. ATTENTION: If no one is at address when delivery is attempted, you will incur a minimum re-delivery charge of $50.00 per order.This charge will be determined by the freight carrier. The Burly Bear will in no way shape or form be responsible for this redelivery and you will have to reschedule a delivery with the freight carrier. REMOTE ACCESS If your delivery location is not accessible by delivery truck the carrier will have to transport your delivery items to the nearest point. You will be soley responsible for pick-up and transportation to desired remote area. TRACKING YOUR ORDER Shipping times Usually average between 7-10 working days(not including Saturday, Sunday or Holidays), but can take as long as 4 to 6 weeks. If delivery notification is not made within approximately (10) ten working days from shipping notification, you will want to double check the transit location of your order throught FedEX or UPS web sites. Please email us at sales@theburlybear.com or call us at direct at (928)367-2327 your invoice number and we will respond promptly with the most current information available to us. UPON ARRIVAL When your items arive please be prepared to inspect your order. Check your bill of landing to verify that all of your items have been delivered.The bill of landing will indicate what items left the factory and should be in your shipment. You will want to open all items imediately and inspect them for transit damages. Please do not sign the bill of lading until you 100% Satisfied that the merchandise has been delivered in good condition.If there are slight dings,or scratches that you can repair or live with The Burly Bear can give you a credit towards future purchases(usually up to 10% of items value.) Once you have signed the bill of lading you become the legal owner of the product and can not file a damage claim. This is standard for all Trucking Companies. If you should discover damage, it is your responsibility to notify us immediately, at (928)367-2327 or via email at sales@theburlybear.com . If their is damage you must make noteon the bill of lading before signing it with the driver. If it is beyond repair by either you or a repair service REFUSE THE SHIPMENT!!. The Burly Bear or its Vendors will be happy to handle the claim on your behalf and ship out a new product to you as soon as possible. Thanks once again and have a Great Day! !